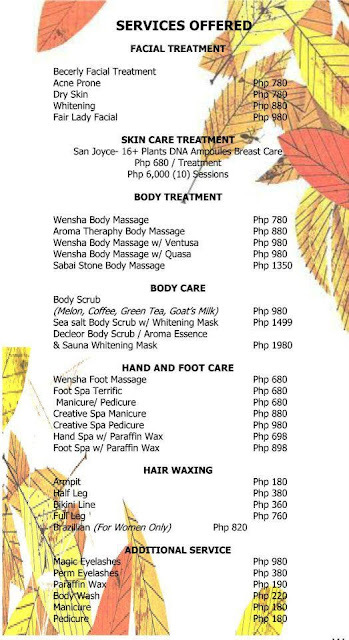 So Wensha Spa Center, as I've said from my previous post, has 2 branches which are both open 24/7 - the Timog, Quezon City branch (see map, point A) and the CCP, Pasay City branch (see map, point B). You may drag+click on the map to enlarge. It was a rather spontaneous visit and I did not have much time to spare for research. Although I was able to conduct some last-minute browse on the net through my phone that night while we were already on a cab to Timog. There were bad reviews I've read about this spa center. Issues on bad food quality, sub-standard massage service and harassment by/of the masseurs/masseuses. I think it's just a matter of timing. Lol. So of course what I'm gonna share tonight is our experience on the night of our visit. When we get there at around 9:30pm, there was a line at the reception with about 8-10 people all waiting to check-in and some 6-8 people checking-out. Wensha offers several massage, scrub, mani/pedi, facial options. You may consult this service list taken from Wensha's website. I'm not sure though if this is updated. The service we availed was the Wensha Body Massage for 1 hour (680php/person). This already includes the use of the wet floor (dry sauna, steam sauna, hot "jacuzzi", cold "jacuzzi"), locker with automated sensor locking device and shabu-shabu/buffet. You can stay at a maximum of 6 hrs at the branch, but if you exceed, you have to pay 100php/hour. I wasn't able to take photos of some areas, especially the wet floor, because it was not allowed. I just followed cos I don't want to ruin my night of peace and relaxation. locker key as bracelet; never lose this otherwise you shall be charged 2000php. You've seen the photos, now read TheBeehive's comprehensive pros and cons list. their system of tipping is quite compulsory; it pressured me. lol. privacy (or the lack thereof); some massage rooms had their doors left wide open. you could see the naked bodies of the women being slapped, turned and stretched for massage. the staff could and should have had the initiative to close/lock them at all times. not sure if the sheets used on my bed were fresh; as fas as i know, my masseuse just put an extra very thin, white sheet above the green sheet that’s already been on the bed when i entered. some massage rooms can accommodate 6 people, others only 3. would have been better if the rooms could accommodate 2-3 only, for privacy. if you request for hair conditioner, you need to pay 10php. that’s one sachet of cream silk. entrance at the reception area is a (mean girls reference approaching) stressful, surreal blur. they could have instructed us properly but they left us dead, not knowing what to do or where to go next. they should install a guide-for-beginners sign or whatever. So far, those are the things I could think of. 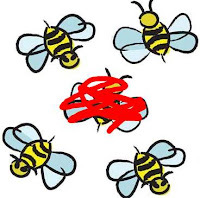 The cons list is quite heavy but I'd still give Wensha 4 nice bumblebees! We have to remember that we went here for the massage. If I went all the way to Timog just for the food, I would have just gone to Saisaki or Dads, right? Thing is, I was satisfied with the massage. That's all that matters. And I was able to relax for 6 hours with food unlike on some spas I've tried before where I can stay for max 2 hrs only. This one's a bargain! #4 Timog Ave., cor. Panay Ave. Q.C. Is the buffet one-time only or for the period of 8 hours, you can eat twice? what is the best time to go in wensha timog? We got there around 10pm but it was still crowded. Probably it's best to visit around midnight so you can stay until morning. I think Wensha changed the 8hrs limit to 6hrs. So if you go there at 12mn, you can leave at 6am which I think is just a good time. Or from 6/7am til lunch time. Enjoy!